The greatest of Namibian adventures is to share daily experiences around the evening camp fire and to sleep under the vast and vaulted skies. These informal and adventurous small group mobile camping safaris offer one of the best value ways of exploring Namibia. On arrival transfer to your hotel for the afternoon at leisure and overnight. After breakfast you are collected by your guide from Wild Dog Camping Safaris for the journey north to Okonjima, stopping en route at Okahandja. Arrive mid-afternoon, with time to set up camp before a late afternoon of education and activities involving the big cats at the AfriCat Foundation. In the evening return to camp for a star-lit dinner (breakfast, lunch and dinner included). An early start this morning for your journey to Namutoni, eastern Etosha. En route you’ll make a brief stop to pick up supplies. Arrive at Namutoni in time for lunch, then enjoy an afternoon game drive in the National Park returning to camp for dinner (breakfast, lunch and dinner included). 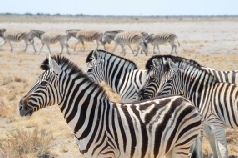 An unforgettable full day through Etosha to Okaukuejo Rest Camp, famous for its rewarding waterhole. A myriad of big and general game plus outstanding bird life is sure to be seen today (breakfast, lunch and dinner included). Begin the journey south with a relatively short drive to the small town of Kamanjab where you make a short stop before continuing on to Kavita Lion Lodge and AfriCat North – the Communal Carnivore Conservation Project (breakfast, lunch and dinner included). After an early start visit the Himba tribesmen and learn about their culture and customs. 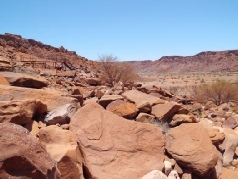 Drive on to the beautiful Damaraland, visiting the Bushman engravings at Twyfelfontein (breakfast, lunch and dinner included). Head deeper to Namibia’s highest mountain, The Brandberg, before moving on to the town of Uis, an old mining town where you can buy semi-precious stones such as tourmaline and amethyst. From here drive to the Atlantic Ocean and the Skeleton Coast, visiting the seal colony at Cape Cross before driving to Swakopmund. Here enjoy two days at leisure and with an abundance of restaurants and sightseeing available, staying in chalet accommodation (breakfast, one lunch and one dinner included). Depart for Walvis Bay for a short visit at the beautiful lagoon, which is home to a vast number of birds including pelican and flamingo, before heading into the Namib desert. After traversing mountain passes, see the breathtaking desert landscapes at Solitaire where, after a long but scenically rewarding drive you will arrive late afternoon. One of the best times to arrive in the desert you’ll be driven to a nearby dune to appreciate the magic brought by sunset, before setting up camp for the night (breakfast, lunch and dinner included). The earliest of starts as you head into the Namib Naukluft Park at dawn to witness the rising colours on the dunes as you drive to Sossusvlei, walking for the last three miles through the dunes – a magical experience in the cool of the morning, with soft sunlight just beginning to play over the dunes. Ancient mineral pans, stunted Camelthorn trees and the chance of seeing a gemsbok or ostrich make perfect photo opportunities. 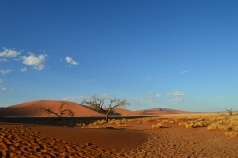 Enjoy the morning in and around Sossusvlei, visiting ‘Dune 45’ then return to Sesriem for lunch. As the day cools off in the afternoon take a short excursion to Sesriem Canyon (breakfast, lunch and dinner included). After breakfast begin the scenic journey back to Windhoek, a journey of about five hours, arriving in the city for a night at the Olive Grove (breakfast included). Transfer to the airport for your onward journey (breakfast included). Namibia mobile camping holidays Prices are per person based on two sharing. Prices include flights, transfers and accommodation, and are subject to availability. Flights from Heathrow - other departures also available, call for details. Holiday ref K0917MU.